Industrial and Organizational Psychology 6 Edition The field of industrial and organizational psychology continues to see attention and growth and has become one of the major applied specialties in the study of psychology. Since findings from research in this field are relevant to everyone who has held a job, and the field has developed proven methods that businesses and organizations need, industrial and organizational psychology is an excellent demonstration of how society can benefit from the study of psychology. 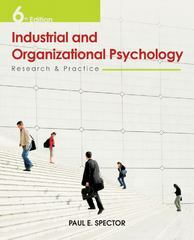 The 6th Edition of Industrial and Organizational Psychology incorporates all new and updated literature that has been written on the topic since the 5th edition. Spector's goal is to provide an overview and comprehensive understanding of organizational psychology. Each of the major areas that comprise industrial and organizational psychology is covered in five parts: introduction to the discipline; assessment of jobs, performance, and people; selecting and training employees; the individual and the organization; and the social context of work.